The core of the system is the new e1X DAC/Control Preamplifier ($6500), which takes in data via ethernet, USB, or any of the other common digital inputs, handling data via TOSLINK, AES, or S/PDIF at up to 24/192; via ethernet the e1X can do up to 24/384. DSD is supported, up to DSD128, delivered to the DAC via DoP. The e1X arrives Roon ready and supports full decoding of MQA. There’s a headphone amp. The DAC/Preamp was feeding the e1X Stereo Amplifier ($6000), which is claimed to deliver 400W into 4 ohms. The gain is adjustable to aid with loudspeaker matching. There’s also an e1X integrated amplifier, which combines this functionality into a single box, except the integrated is less powerful. Loudspeakers are by Audiovector, a Danish company. 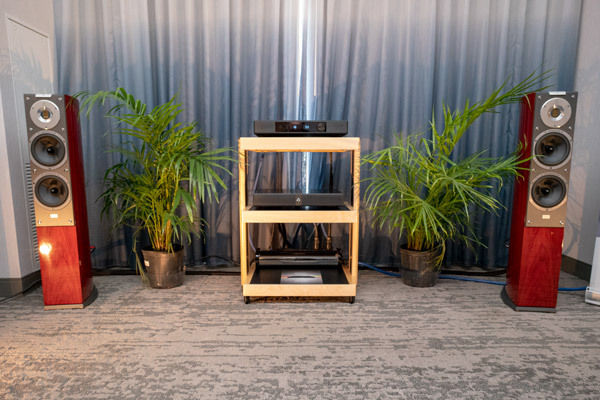 All wood and machined metal, the handsome Audiovector SR 3 Avantgarde Arreté cost $9999/pair and feature an air-motion transformer tweeter and two custom mid-woofers per side, manufactured by Scan-Speak. The mid-woofers utilize titanium voice coils and cones formed from a sandwich of carbon, glass fiber, and Nomex. Asymmetric cabinets reduce internal standing waves. The amplifiers were supported by an HRS Audio stand, and power was filtered by an Audioquest Niagara 1000 Power Filter. I think the cables were also from Audioquest, but I’m not sure. The sound was dynamic, warm, and inviting, with—in contrast to several other systems I heard this morning—no trace of crunchiness or edginess.